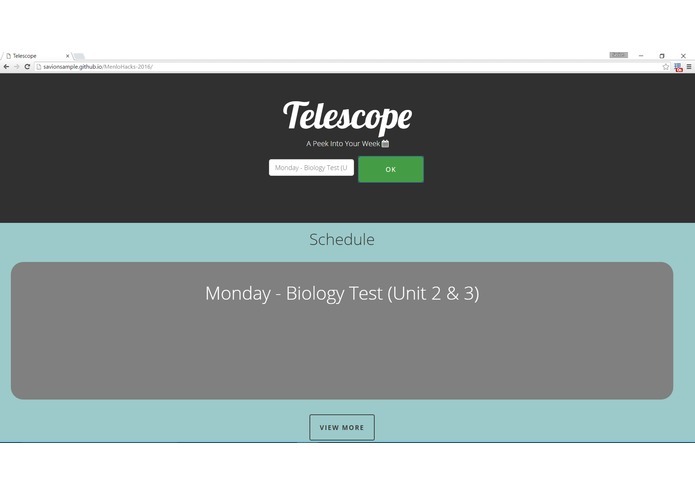 My inspiration was that Menlo Teachers never kept up on scheduling online which made me want to create a better way for them to connect and warn students about assignments ahead of time in a fast and easy way. While there is a calendar on Haiku, it is rarely used and hard to see updates. I used a couple open libraries including: bootstrap (for buttons/overall formatting), font-awesome(for the calendar icon), jQuery(for some cool animations), and another cool animation button. The rest was built with HTML and CSS and some cool Google Fonts (all which can be found in the head). I've only ever built one or two websites before so everything took a lot longer than it should of and I definitely had to sweep through a lot of basic tutorials to refresh what I had learned. It was a challenge trying to get each of the divs to work with each other and not clash, and to make my code work the with jQuery which is always a challenge for me. I also hit a huge block in the beginning with my team trying to come up with some idea and trying to figure out a language to code it in even though most of us only know Java. So overall it was a great experience trying something new and learning cool new languages. Somehow fitting all of our crazy plans into something that anyone can access on the web. Also pushing myself to stay up most of the night to finish, since staying up late has never been my thing. Time management, preparation, being flexible, and being confident in myself and others.